A surprising number of studies are showing how important exercise is to staving off the effects of aging, including cognitive decline. What these discussions never include, however, are descriptions of the types of exercise that get the best results. And this vagueness, plus fears of having elderly people engage in physically demanding workouts, tend to make any progress impossible. 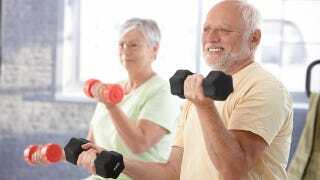 But a new study from Canada suggests that grandma and grandpa should probably starting pumping some iron if they want to slow down the effects of cognitive decline — especially memory loss. Scientists know that mild cognitive impairment is a risk factor for the onset of dementia. Because exercise is becoming increasingly correlated with good mental health, and because age-related cognitive diseases are nearling epidemic proportions, researchers would like to know more. In a study led by Teresa Liu-Ambrose of the University of British Columbia, women between the ages of 70 and 80 who were experiencing mild cognitive impairment were put through 60-minute classes led by a certified fitness instructor two times per week. They used a pressurized air system (for resistance) and free weights, and were told to perform various sets of exercises with variable loads. This went on for 26 weeks while the researchers conducted tests to measure the seniors' cognitive health. After analyzing the data, the researchers concluded that the women had benefited from the weight training — and in more ways than one. They saw noticeable improvements in memory and attention, as well as their ability to resolve conflicts (a neat bonus). These classes were also shown to be responsible for physical improvements, including general balance and mobility. As a result of the study, researchers believe that resistance training done twice a week could serve as a promising strategy to stave off the effects of cognitive decline in seniors, especially the onset of Alzheimer's. It's also clear from the study that, when supervised and guided properly, seniors can reap the physical benefits of weight training as well. The study was published in JAMA and can be read here.